I’ve joked about these sorts of kits before in our Women in Youth Ministry Facebook group, as I’ve seen youth pastors “meme” starter packs before. However, like most youth pastor memes, they are very male-centered. So, I created our own, using suggestions from our group! I don’t think my sister knew any of this, but nonetheless, she put together a wonderful kit for me this Christmas, and I thought I’d share it with you! Good lotion to keep your skin soft and smelling nice, when showers at retreats are far and few between. Study Bible with SOCIAL JUSTICE-oriented commentary. Use it to remind the fundies that our God is an inclusive one. A Dotted Bullet Journal. To plan sermons, retreats, revenge, confirmation, the demise of conservative evangelicalism, and maybe a period tracker too. Bonus: Men will see the Enneagram Type 8 sticker on the front and be too scared to touch it. Wine (needs no reason). Pinot noir, caviar. Pinot noir, Mid-Sized car. This kit was PERFECT for me, and I will use EVERY item (wearing those leggings now, hellooooooo). What would you include? 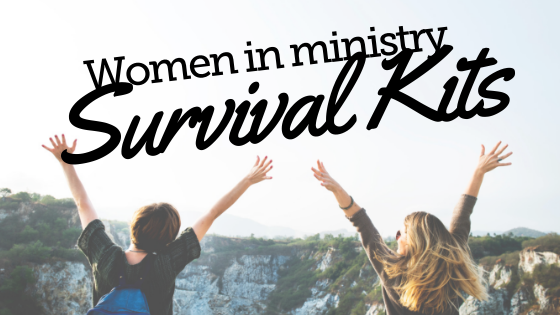 Women in Youth Ministry Month!